Take advantage of our special mid-week promotional rates to stay in a two room luxury suite with king bedroom, spa bathroom and your own private sitting room. Stay Sunday through Thursday nights for just $280 per night, per couple. Even sweeter, the rate includes breakfast served in our sunny Garden Room each morning! Valid Sunday - Thursday nights for new reservations only January 2 - May 2, 2019. Available for Suites 3, 5, 12, 14 and 26. This rate must be requested at booking and may not be combined with any other promotions or discounts. 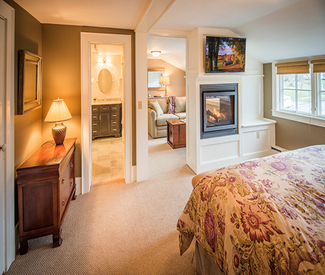 A 9% Vermont Rooms Tax will be added to this special rate. Based on availability at time of booking and does not include $15 per night service charge. For new reservations only and not valid during any holiday period.